Cedar can be used in aquariums, provided it is known to be safe and free of harmful chemicals. Make sure your cedar driftwood has been cured and soaked for the safety of the fish in an aquarium. Driftwood found out in nature can have a few problems that might threaten the fish living in your tank. 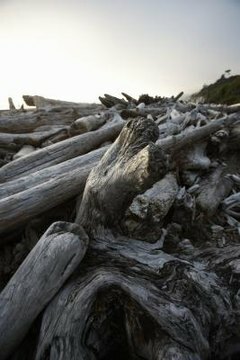 Driftwood that has been floating in unsafe waters might contain chemicals and other substances that could be toxic. If the wood was not fully submerged, it might be rotting in places, which can also harm fish in the tank. Because cedar is a soft wood, it can be more prone to rot than hardwoods. Driftwood found out in nature must be soaked for one to two weeks to allow any excess tannins to leach out of the wood so the pH levels in the tank remain balanced. Another option available to aquarium owners is store-bought driftwood or ceder pieces. Commercially available, this wood has been aged and treated to ensure it doesn't contain rot or chemicals that will compromise the safety of the fish living in the tank. Make sure the driftwood you purchase is safe for aquarium use, as the wood sold for reptiles may have chemicals that are harmful to your fish.